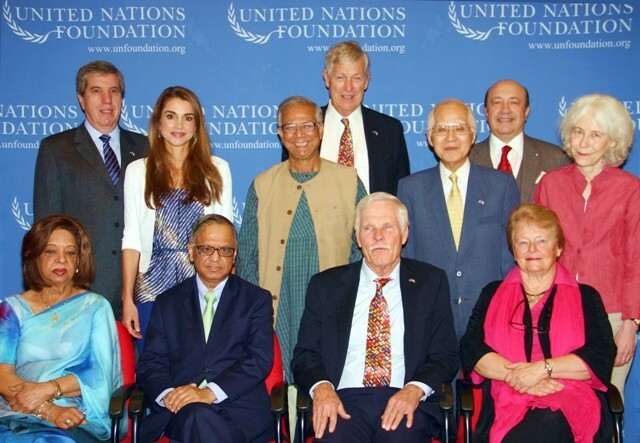 (Office of Her Majesty, Press Department- New Delhi) – Her Majesty Queen Rania Al Abdullah attended the United Nations Foundation (UNF) Board meeting in New Delhi today, in her capacity as the only Arab member of the board. The meeting took place in India to allow UNF members to see first-hand how partnerships and innovation are powering a more sustainable future for India and the world. Presiding at the meeting were Foundation Founder and Chairman Ted Turner, Foundation President Timothy E. Wirth, and N.R. Narayana Murthy, Co-Founder and Chairman Emeritus of Infosys Limited. In addition to Her Majesty, other board members include Kofi Annan, former UN Secretary-General and UN Special Envoy for Syria; Hisashi Owada, President of the International Court of Justice; Igor Ivanov, Former Minister of Foreign Affairs of the Russian Federation: and host of leaders and experts in the field of development from around the world. The United Nations Foundation builds public-private partnerships to address the world’s most pressing problems, and broadens support for the United Nations through advocacy and public outreach. Through innovative campaigns and initiatives, the Foundation connects people, ideas and resources to help the UN solve global problems. The Foundation was created in 1998 as a U.S. public charity by entrepreneur and philanthropist Ted Turner and now is supported by global corporations, foundations, governments, and individuals.